SIZE : IT41 / US16 / will fit a size L. Fitting : Slim fit. Material : 97% Cotton, 3% Elastane. Color : White. Model :Long sleeve standard cuff. Condition is Pre-owned. It is in good preowned condition with no flaws that I’ve found. Armpit to armpit: 27” across. The shirt you see in the photos is the exact shirt you will receive. Don't like the price?. 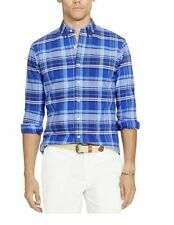 Gold Label Roundtree Yorke Mens Blue Striped Non Iron Shirt Size 16 1/2 36. Condition is Pre-owned. Shipped with USPS Priority Mail. Tracking included. Dress shirts for men come in a variety of styles, such as with various cuff styles, button-down, classic-fit, or regular-fit. There are also various brands available such as Calvin Klein, Joseph Abboud, The Men's Warehouse, Croft, and Van Heusen. Each type serves to fit your business, social, or personal needs. How do you wear a patterned dress shirt? 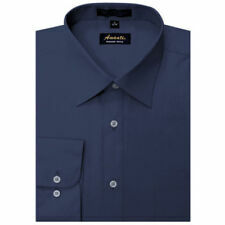 Solid dress shirts are the bedrock of professional business clothing practically everywhere. 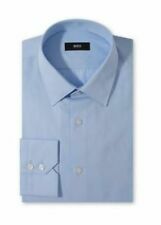 In particular, blue or white dress shirts work very well and are a safe choice, but light blue, light pink, gold, and lavender dress shirts are also an option that can check the mark on your shopping list. Solid black dress shirts are generally reserved for somber settings. Solid shirts are likely the dress code of choice at established, conservative businesses and are a good choice when you are unsure what type of shirt to wear. Striped shirts by their nature are a more casual option to the solid shirt, but they are still considered dressy. Many workplaces adopt a business-casual dress code for at least part of the week, and striped dress shirts excel in this environment. If you do choose a striped shirt, make sure the size of the stripes differs from other stripes in your outfit, such as those on your tie. 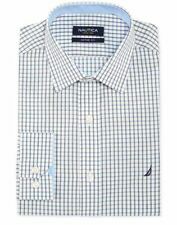 The checked-pattern dress shirt is casual and is the choice of many office and store workers during weekend socializing where they're still going to meet with clients or others in a business setting or to discuss professional matters. What are the types of collars on dress shirts? The point-collar is one of the more traditional, classic looks and is practical for any regular professional situation where a classic look and respect for tradition are appreciated. The button-down is a good choice if you need a slightly more relaxed fit and need to wear a tie often but not during every business occasion. The spread-collar creates a wider than normal distance between the two points. It is a good choice if you have a thin, angular face as it helps to accentuate the vertical lines of the face. How does fabric type affect dress shirt fashion? Choosing a dress shirt is already a step in the right direction of style for men. If you have different fabric weaves on hand, you'll be able to conquer any professional scenario. You should choose cotton for a breathable fit, oxford for a relaxed fit, poplin for a casual look, and herringbone twill for a quality, traditional look.